We’d love your help. Let us know what’s wrong with this preview of Requiem for a Mezzo by Carola Dunn. Daisy Dalrymple and Scotland Yard inspector Alec Fletcher enjoy a splendid performance of Verdi's Requiem, featuring her neighbor's sister Bettina, until the poisoned singer suddenly breathes her last. The diva was difficult and provoked many enemies - a philandering tenor, a burly Russian bass, and her own turbulent vocal coach husband. To ask other readers questions about Requiem for a Mezzo, please sign up. I never received requiem for mezzo it is now January and the book still has not made it I would like to know if I will be receiving this book ? Had it not been for Jessica Ennis and Mo Farrar et al i probably would have finished this ages ago. It is an easy quick read of the Agatha Christie school though the plot is nowhere near as well set up. This is the first of the series that i have opened and it teeters on the edge of whether I will bother to open any others. It was a perfectly serviceable story involving a murder, lots of suspects, over the top characters and a solution with some love interest thrown in but that was its problem.. Had it not been for Jessica Ennis and Mo Farrar et al i probably would have finished this ages ago. It is an easy quick read of the Agatha Christie school though the plot is nowhere near as well set up. This is the first of the series that i have opened and it teeters on the edge of whether I will bother to open any others. It was a perfectly serviceable story involving a murder, lots of suspects, over the top characters and a solution with some love interest thrown in but that was its problem.....oodles of writers have blazed this trail before and Dunn seems just to be trailing along in the cinders left by the passing flames. The story is set in the early 1920's and everything that could be crammed into the story is crammed in. We have, in the space of 232 pages, references and links to the Russian Revolution, the 'Great War', the weird new fashions of hairstyle and dress, the clash of the old pre-War society and the thrusting new one, the seeking of new career paths and the seeking after female independance, the rise of the 'lower classes' and the ebbing away of the 'upper class' but it all rings pretty hollow. All the characters, whether good or bad, are so telegraphed ahead that it would take a total idiot not to know where the story is going. I am rubbish at guessing the murderers in stuff and yet I knew from far back in the book who did the deed. Dunn tried far too hard to tell us which characters we were supposed to like and loathe, the ones we were supposed to smile at and those we were to sneer at. When it suited her story, infidelity was to be tutted over and frowned upon but then at other times it was presented as the path to release and fulfillment. Come on Dunn, lets have a bit of consistency here. Our heroine, the Honourable Daisy Dalrymple, is the daughter of an aristo but she is only honourable cos her title could not be inherited by a woman but passes to the next male heir, a cousin. Her burgeoning romance with the Detective Chief Inspector enables all sorts of predictable plotlines to move forward. There are also heavy doses of anti-semitism from many of the characters which, though sadly present in society at this time, is rather laid on with the proverbial trowel. There are excitable foreigners and mousey sisters, bitchey sopranos and lustful tenors and there is even a ridiculously unsympathetic vicar thrown in for good measure. Cliche after cliche, exaggeration after exaggeration. Not particularly bad but not particularly good. I would say this is a 2.5 leading to a 3. An easy read for times when you are likely to be interrupted a good deal. Train journeys, waiting in the dentist, stuck in traffic but not a book that brings you into a real place. Now here comes a diatribe from me and apologies ahead of time but you can always miss this bit out. She and 'all her set' talk in that ridiculously stupid way that only characters in books written about the 1920's or 30's ever speak. I mean seriously, did anybody on God's earth ever say 'spiffing' or 'ripping' or 'you are a duffer' or other such inanities anywhere other than in the imagination of writers desperate to create a social strata that, though it really existed, would no more have spoken in such stupid, clipped ways than would people now really grab their groins for no apparent reason, poke the air with their hands as they speak and say innit and kinda and bro and the other inarticulate nonsense that has been created as the new 'youff speak' had it not been made clear that that is the cool way to speak. Actually thinking about it, perhaps Dunn is right, maybe they did talk in such stupidly effected ways because peer pressure, as we see every day on the media, can create empty, meaningless inarticulate nonsense and so, just as i am pleased I am too old to bow to pressure and tug on my groin in public to punctuate anything I might have to say, so i am also pleased that I was spared the inane, pretentious drivel of the flapper era......maybe that is why i don't like PG Wodehouse. Another fun murder mystery in the Downton Abbey tradition, although this one takes place entirely in London. Daisy's relationship continues to deepen with Alex, but that's about the only reason to read these in order. Well narrated & a pretty good mystery, although I had some trouble keeping 2 of the couples straight. There are a lot of suspects & those 2 couples just didn't strike me as memorable enough. The rest of the characters were, though. I'm looking forward to reading #4 when I c Another fun murder mystery in the Downton Abbey tradition, although this one takes place entirely in London. Daisy's relationship continues to deepen with Alex, but that's about the only reason to read these in order. Well narrated & a pretty good mystery, although I had some trouble keeping 2 of the couples straight. There are a lot of suspects & those 2 couples just didn't strike me as memorable enough. The rest of the characters were, though. 3.5 stars. These are sort of delightfully light and readable, without doing anything annoying. And the mysteries are half-decent. Basically, I really like the characters. Particularly the policemen. Tring and Ernie, and their teasing and banter with Alec is fun. Also enjoy Alec and Daisy's dynamic. And Daisy's habit of exclaiming "Spiffing!" amuses me to no end. Perhaps I am easily amused, but you know what? If other things are stressful, why not? It seems that period cosy mystery writers feel the need to write certain "installments" in their series. We have the War Hero Mystery, the Train Mystery, the House Party Mystery, the Sporting Event Mystery, the University/Public School Mystery, the Formal Dinner/Ball Mystery...and in this case, the Musical Mystery. When I started this one, I was strongly reminded of Greenwood's Murder and Mendelssohn, except in this case it's the mezzo of the title who gets topped instead of the director. I've s It seems that period cosy mystery writers feel the need to write certain "installments" in their series. We have the War Hero Mystery, the Train Mystery, the House Party Mystery, the Sporting Event Mystery, the University/Public School Mystery, the Formal Dinner/Ball Mystery...and in this case, the Musical Mystery. When I started this one, I was strongly reminded of Greenwood's Murder and Mendelssohn, except in this case it's the mezzo of the title who gets topped instead of the director. I've sung in many a chorus as a contralto. Believe me, you do want to kill the soprano soloist--frequently. This little diva really had it coming--but who dun it? The betrayed husband, one of her many lovers, the sister she treats like a servant, or the Unusual Ukranian bass? Daisy has mysteries of her own--should she finally bob her hair? Where are things going with Alec? To tea or not to tea? The Daisy Dalrymple books are definite cosies: mostly victims the reader will dislike, while the real culprit is never someone the reader is meant to like, or had a really good reason if they are; a ‘clean’ romance, with Alec and Daisy decorously falling in love with only hints here and there of physical lust; blood and guts minimised. Requiem for a Mezzo continues in that vein as expected, with the poisoning of a woman who rather made the lives of everyone around Reviewed for the Bibliophibian. Bk3 in the Daisy Dalrymple series is as charming and fun as the first two. Belonging definitely in the "cozy crime" category, it's light and easy to read and is perfect as a palate cleanser between heavy novels or just to lighten your mood. If you're a fan of Dame Agatha and Phryne Fisher, you really need to get your hands on this series, you won't be sorry. I'm just happy that there's about twenty books so far, and I think she's still writing! Predictable plot that serves as a vehicle to develop the main characters relationship. That may be pretty standard cozy mystery fare, but I'm disappointed in Daisy's lack of deductive ability. It makes sense that the actual police detective is the one who figures it all out and catches the criminal, but in that case, shouldn't it be the Alec Fletcher mystery series? Good. Not very complex, just a nice little murder mystery. You can count on the Daisy Dalrymple series to contain interesting and varied characters in the 1920s, post-WWI Britain era - aristocrats, middle class, servants, and just about everyone "in-between". They're solid books, easy to read, not too taxing on the brain, and generally provide the reader with all the necessary clues to solve the mystery. Sometimes, the clues come early and the murderer is obvious - as in this book. But they're delightful reads, mostly because of the main characters: Daisy (the "Honorable"), Chief Detective Inspector Alec Fletcher (a love interest for Daisy), Lucy (Daisy's friend and flat-mate), Philip Petrie (childhood friend), and Alec's fellow Scotland Yard men: Sergeant Tripe and Ernie Piper. In this book, Alec and Daisy are out on a date, attending a matinee performance of an opera, Verdi's Requiem, when the Mezzo-Soprano, Daisy's next-door neighbor, Bettina (Elizabeth "Betsy") Westlea (aka Mrs. Roger Abernathy) dies on-stage, just before one of her big solo parts. Bettina had just taken a drink of her wine, when she sputtered and choked, and then fell. The bitter smell of almonds was everywhere. But was it truly cyanide poisoning? Because Bettina drank ratafia, a British "lady's" liquer made from the same peach and almond pits as cyanide and with the distinct almond odor and flavor. And who killed Bettina? Her downtrod sister, Muriel, who was in the Chorus - never the golden-haired, beautiful favorite like her sister, Muriel was expected to take care of her sister by her parents and her sister. She saw to Bettina's every need, and even lived with Bettina and her husband, Roger, in London as a sort of housekeeper. Bettina had interfered constantly in Muriel's life, selfishly claiming every ounce of attention and glory. And when Yacov Levich, a Russian Jew who plays the violin in the orchestra, started paying attention to Muriel, Bettina threatened to tell their parents, effectively putting an end to any hopes Muriel might have had of a relationship. Was it her sainted husband, Roger Abernathy? Bettina only married the older man because he was her ticket out of Hampshire -- he offered marriage and vocal lessons... and possible connections. But Roger wasn't young, gorgeous, or rich. And he had a heart condition. And he knew of Bettina's many love affairs. Did he really love her enough to overlook those infidelities and the crass, cruel way she treated him? Bettina even left all her worldly goods to her sister Muriel, not her husband - another slap in Roger's face? Was it Yacov, trying to make the way for himself with Muriel? Was it one of Bettina's many former or current lovers? Gower, the tenor, who usually preferred the exotic foreign beauties, but chose Bettina and promised to use his influence to push her career farther and higher? Mrs. Gower, who put up with foreign mistresses, because Mr. Gower always came back to her and the husband at the end of the season; was she afraid that the British Mezzo-Soprano would steal her husband away for good? The Ukrainian bass, Marachenko, who had given Bettina a fortune in smuggled Russian jewels -- the same man she'd publicly slapped and called names, shaming and embarassing him? Was it the conductor, Cochrane? He showed up to her house weekly... but it wasn't for Bettina, it was for Oliva Blaise, taking voice lessons with Roger. Bettina threatened to reveal their affair to Mrs. Cochrane. Did Cochrane kill her to prevent her from tattling? Or did Olivia try to protect her lover? Or was Olivia trying to eliminate her competition? After all, Olivia was to have the Mezzo-Soprano role before Bettina blackmailed her way into it. Or was it Mrs. Cochrane, the older, rich woman whom Cochrane married for position and money? Mrs. C is almost another Lady MacBeth, willing to do whatever it took to further her husband's career and secure a baronetcy or knighthood for him. And will Daisy and Alec ever have a real date without a murder interfering? There is always a large and varied cast of characters in these books, and sometimes it takes a bit to sort out who is whom. This book is no exception. It's interesting to watch Alec walk the tightrope between professional and personal... see him struggle with Daisy being involved in his murder investigations, yet know that he can rely on her to find info and help get to the truth. Daisy is also walking her own tightrope, falling for Alec but dealing with the lines between the classes, somewhat blurred by the war, and yet firm in the minds of many; upper-class aristocrats and middle-class policemen (however educated) don't mix socially or personally. Charming historical mystery series. I'm looking forward to more adventures with Daisy Dalrymple. 'Daisy! Don't tell me you've fallen over another dead body?' This is a question that Detective Chief Inspector Alec Fletcher asks Daisy Dalrymple on page 15 of this sparkling mystery novel. An 'Daisy! Don't tell me you've fallen over another dead body?' This is a question that Detective Chief Inspector Alec Fletcher asks Daisy Dalrymple on page 15 of this sparkling mystery novel. And so Daisy undertakes, once more, to assist the police in their attempt to uncover the murderer. Slightly different from her country house rambles because, naturally as Daisy has taken Fletcher to the concert so he is on hand to begin investigating, this one takes place in the Royal Albert Hall. It is the usual enjoyable romp with plenty of suspects and red herrings to lead the reader down blind alleys but in the end Daisy is triumphant - with of course the help of DCI Fletcher! And all the while she keeps the love interest going with her craving for Fletcher ... who some day she may marry! The third book in the Daisy Dalrymple series, I feel as though each book further into the series really does get better and better. I found Requiem for a Mezzo overall flowed much better, you can almost sense the confidence Dunn gains in her writing and Daisy Dalrymple as a character as the series goes on. 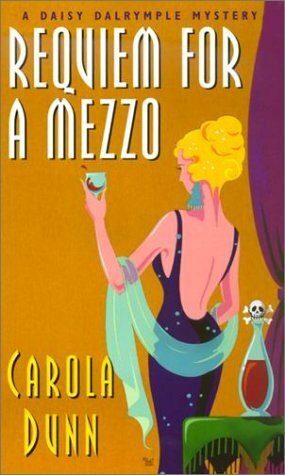 Requiem for a Mezzo is my favourite of the Daisy Dalrymple mysteries so far. I love the way Dunn perfectly depicts both the characters and London so well, set in the 1920's. I adore learning m The third book in the Daisy Dalrymple series, I feel as though each book further into the series really does get better and better. I found Requiem for a Mezzo overall flowed much better, you can almost sense the confidence Dunn gains in her writing and Daisy Dalrymple as a character as the series goes on. Requiem for a Mezzo is my favourite of the Daisy Dalrymple mysteries so far. I love the way Dunn perfectly depicts both the characters and London so well, set in the 1920's. I adore learning more about Daisy as each book goes on and I loved that Requiem for a Mezzo introduced a lot more of Alec's character and home life. It's lovely seeing the relationship between Daisy and Alec develop. The Honorable Daisy Dalrymple writes magazine articles for a living and for fun, pokes her nose into the cases of her friend, Inspector Alec Fletcher of Scotland Yard. In this, the third book of the series, the attraction between Daisy and Alec continues to deepen while they sort out their class differences. This book is ostensibly about the murder investigation of an unpleasant opera singer, but the mystery is so far from thrilling that only my affection for the main characters kept me reading. The Honorable Daisy Dalrymple writes magazine articles for a living and for fun, pokes her nose into the cases of her friend, Inspector Alec Fletcher of Scotland Yard. In this, the third book of the series, the attraction between Daisy and Alec continues to deepen while they sort out their class differences. This book is ostensibly about the murder investigation of an unpleasant opera singer, but the mystery is so far from thrilling that only my affection for the main characters kept me reading. If you liked the first two books about Daisy, you might as well read this one, but don't expect too much. Daisy Dalrymple is having an evening out with Alex Fletcher at a performance of Verdi's Requiem when one of the singers die, Daisy's neighbour Bettina Westlea, who hasn't made friends around her so there's lots of suspects. I like it, more 3.5 but not quite 4 stars, I didn't find it quite as good as others in the series but it's still quite good. Carola Dunn writes nice murders--the person who dies is usually reprehensible and the murder is not too gross--no detached limbs--severed heads etc. In the end the murderer only harms the victim and the killer. Not sure if that makes a lot of sense but I guess that is the best thing about the cozy genre--there is humor, fun characters to get to know and the grossness is kept to a minimum. 3 1/2 stars. Nothing earth shattering. This is summer reading for me. Light, breezy, not too taxing of the brain during the hot weather. I will go on to #4 in the series. I was pretty disappointed with this installment, honestly. The climax was totally underwhelming, there were way too many tangential plot threads (Bolshevik conspiracy, anyone?) and the true murderer was obvious at least fifty pages before the boring conclusion. The vast majority of this book consisted of repetition of details of the timeline surrounding the murder and of the extramarital affairs of several suspects. I'm not super keen on how the book switches from Daisy's perspective to Alec's p I was pretty disappointed with this installment, honestly. The climax was totally underwhelming, there were way too many tangential plot threads (Bolshevik conspiracy, anyone?) and the true murderer was obvious at least fifty pages before the boring conclusion. The vast majority of this book consisted of repetition of details of the timeline surrounding the murder and of the extramarital affairs of several suspects. I'm not super keen on how the book switches from Daisy's perspective to Alec's perspective to add exposition. It doesn't feel so much like a Daisy Dalrymple mystery if more than half the book is told from the perspective of another character; Daisy honestly didn't even do much besides listen to people conveniently tell her everything she needed to know because she "just has one of those faces," basically. Self-appointed sleuth Daisy Dalrymple gets involved in the murder of her mousy neighbor’s sister, a rising opera star in London. After a dramatic collapse from poisoning on stage, the abrasive mezzo’s fellow artists are nearly all suspects. Just so happens that Daisy’s budding romantic interest, Detective Chief Inspector Alec Fletcher of Scotland Yard, is her companion at the performance of Verdi’s Requiem. A web of motives, means, and opportunity unfolds as they investigate. A second murder of Self-appointed sleuth Daisy Dalrymple gets involved in the murder of her mousy neighbor’s sister, a rising opera star in London. After a dramatic collapse from poisoning on stage, the abrasive mezzo’s fellow artists are nearly all suspects. Just so happens that Daisy’s budding romantic interest, Detective Chief Inspector Alec Fletcher of Scotland Yard, is her companion at the performance of Verdi’s Requiem. A web of motives, means, and opportunity unfolds as they investigate. A second murder of the mezzo’s competitor complicates the case, raising questions of one or two perpetrators. The rather predictable plot tries to keep all suspects active, throws in a red herring, and ends with a mildly surprising second murderer. The style is ultimate 1920’s England, going out of its way to sound just too upper-crust British. A more diverse social portrayal and enlargement of common and lower class characters would be welcome. Most characters were lightly drawn, though Daisy and Alec are enjoyable and clever. An entertaining read, it still lacked some essence of engagement, leaving me uninterested in reading others in the series. Not my favourite Daisy Darymple book, for me it was a bit too slower pace compared to some of the other stories. The story focuses on Daisy's next door neighbour Bettina who is an opera singer and her live in sister. Daisy is given tickets to Bettina's next performance and halfway through Bettina dies on stage. Doctors in the crowd suggest that Bettina has been poisoned, so the search begins of the attendees to work out who had a motive to kill. The characters while interesting all seemed to be ha Not my favourite Daisy Darymple book, for me it was a bit too slower pace compared to some of the other stories. The characters while interesting all seemed to be having an affair with each other which made the story quite hard to follow at times. Some of the ladies knew their husband was having an affair, Bettina's husband knows she is involved, but others have no clue! This review has been hidden because it contains spoilers. To view it, click here. Gosh, do I love cozy mysteries, especially when the characters are so likable. Yes, in this series there are a lot of class issues that get to me, but are explained away by the forward-thinking aspects and the caveat that this is set in the early 1920s England. In this third installment, Daisy does not suspect the actual murderer, the husband of the horrible titular mezzo. However, as in the first book, the culprit is sympathetic and not brought to blind justice--unless divine justice of a sudden Gosh, do I love cozy mysteries, especially when the characters are so likable. Yes, in this series there are a lot of class issues that get to me, but are explained away by the forward-thinking aspects and the caveat that this is set in the early 1920s England. In this third installment, Daisy does not suspect the actual murderer, the husband of the horrible titular mezzo. However, as in the first book, the culprit is sympathetic and not brought to blind justice--unless divine justice of a sudden, timely heart attack counts. It was good, if you like an easy read and a quick whodunit them you can't go wrong with these books. I like the easy way Mrs Dunn sets he scenes and puts you in the right atmosphere for the Victorian age. Most enjoyable. As for the heroin falling in love with the detective, well it's been done many times before, Ngaio Marsh, Edward Marston (The train Detective), Dorothy L. Sayers, and probably many others. Another nice addition to the Daisy Dalrymple series. A singer dies on stage, obviously of poisoning, during the performance of Verdi’s Requiem, and of course Daisy is in the audience. Furthermore, she is the next-door neighbor to the dead singer and her family. She has to help with the investigation. A number of colorful theatrical personages, some of them over-the-top opera divas, both male and female, enliven this otherwise rather bland mystery. A fast and fun read. 3 1/2 stars Another fun cozy mystery by Carola Dunn. I enjoy listening to these audiobooks. The narrator is particularly good. I love the 1920's time setting in England. This mystery involves a Mezzo-Soprano who dies during a concert Daisy and her romantic interest Alec just happen to be attending. I like the decent mystery and the light romance. Looking forward to the next book in the series.